Audio Pro Addon C5 review | What Hi-Fi? 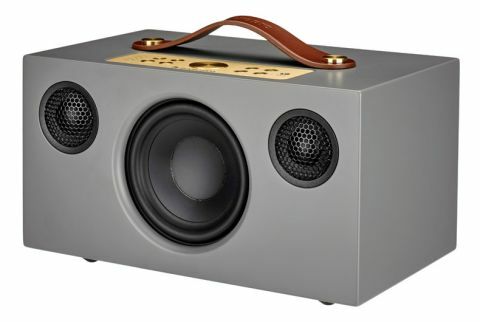 It may have taken longer to get connected than your Gran, but Audio Pro’s Addon range of wireless speakers has finally discovered the internet – and it won’t be using it to Google knitting patterns or make Skype calls to its relatives. Much like your Gran, however, the Swedish manufacturer could tell you how it’s managed just fine all these years without it. The Addon T3 was our wireless speaker Product of the Year in 2015 and held onto its Award the following year, while the T5 earned itself a five-star review. As a producer of affordable one-box Bluetooth speakers, Audio Pro has an enviable recent history. Audio Pro’s products have been so good the option to place its speakers throughout the house in a multi-room set-up makes perfect sense. Thanks to two new speakers, the Addon C5 and C10, plus a wireless hub named Link 1, it's now a possibility. The great thing about these is current Addon users needn’t replace their existing units to incorporate them in the household set-up. The new speakers are able to act as a parent and control Bluetooth-only gear through the Audio Pro app. The first of these new releases to receive the What Hi-Fi? treatment is the Addon C5. In effect, it’s an Addon T5 with internet and multi-room capacity. From the front it looks identical, with its familiar eyes-and-nose configuration of a 10cm woofer flanked by 18mm tweeters. Things start to differ as we peer at the roof of the Addon C5 - there's a large circular volume control surrounded by sets of four smaller buttons: power, play/pause, input selection and Bluetooth pairing to its left, pre-sets to its right. Here’s where you’ll find the aux-in socket, which will save you having to tip the speaker forward and fumble around at its rear to find a connection. Inputs on the Audio Pro’s rear are reserved for those more permanent fixtures – mains power, ethernet cable and RCA – alongside outputs for sub-woofer and USB device charging, plus a toggle switch for optimised playback. Of course, a multi-room speaker such as this cannot be judged without considering its app. It’s rare to find these apps being difficult to navigate - we aren’t surprised to find Audio Pro’s logically laid out, with no real searching required to find tabs for the major streaming services and any external NAS drives. A much more common problem with multi-room apps is how buggy they can be – especially new ones that have had perhaps less time to iron out any creases. Apps like this can range from a tad frustrating to absolutely infuriating, so we’re pleased to be able to report we find no such problems while playing around with the Addon C5. We have an inkling the Addon C5’s sound might be decent, so we set ourselves up for a party with The Rapture’s Echoes. Our suspicions are confirmed within a minute of opening track Olio. The heft is there in the kick drum, which thumps with metronomic precision; textures are exposed in the synthesizers; Luke Jenner’s wail stretches dizzyingly in-between. The Addon C5 cannot be tripped up, not in its organisation of Heaven’s discordant vocal harmonies, or the same track’s off-kilter rhythms. Not by the searing treble of the guitars in the album’s title track, nor when Open Up Your Heart demands delicacy and nuance. This range of speakers has always been blessed with straightforward musicality, but as part of a multi-room system the range of tasks the Addon C5 is asked to perform is likely to be wider. Talk radio and podcasts are on the menu, perhaps even services as an upgrade to TV speakers. So let it be known the C5s most obvious talents – expressive dynamics and low-end stability – are entirely transferable. We listen to Bob Mortimer and Andy Dawson’s football podcast Athletico Mince, for example. The Addon C5 is as happy expressing the irreverence in Mortimer’s tone – and the desperation in Dawson’s as he attempts to say something funny – as it is laying down the grooves on Echoes. There aren’t many wireless speakers we’d want throughout the house as much as these, and we’d put a modest bet on you feeling the same way.